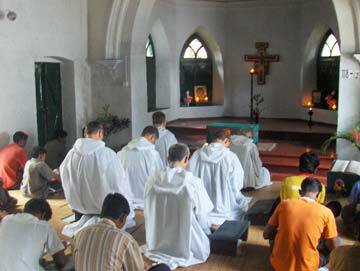 Brothers from Taizé have been living in Bangladesh since 1974. After some years in Chittagong, they moved to the capital, Dhaka. Since 1987 their home has been in Mymensingh. Right from the start they have placed much emphasis on the young; setting up small schools for the poor – at the moment there are seven of these; finding ways to support students in their studies; organising meetings for prayer and reflection, regularly in different parts of the country; one of the brothers has been teaching in the major seminary in Dhaka for nearly thirty years. An important preoccupation that has emerged through the years is with people who are disabled, through the “Community Centre for the Handicapped” and through the pilgrimages for the disabled and for persons with differing mental capacities, which the brothers organise in different parts of the country. The brothers work not only with Bengalis but also with people from the various tribes, especially in the villages; they try to promote understanding between Christians of different denominations, with people of different faiths. Their life in Mymensingh finds its rhythm in the prayer three times a day. Every morning, six days a week, between 6 and 15 very sick and poor people come to our house. 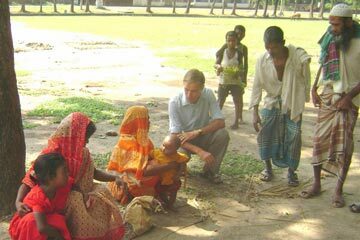 Through all the years we have been in Mymensingh, it has been possible to help countless extremely poor people who would never have had any chance of medical treatment. One of the consequences of poverty in Bangladesh is that many people have no money to get treatment when they are ill. Many die of illnesses which could be easily treated, simply because they do not have money to buy medicine or go to hospital. Those who come know that we will only help the very poorest among them; and even if they are poor, we ask them to contribute something, according to their means. If they cannot pay for all the medicines, they will pay for some of them, or help with the travelling expenses. Or sometimes it is easier for them to contribute produce from their village. To take care of sick people is certainly beautiful, but not always easy. For example, there are parents who are on the point of being cured, but they leave the hospital before they are completely healed because they know that their children need them badly, and they cannot wait anymore. After a few months or even weeks, they have to come back to the hospital as emergency cases, and we have to start all over again. Among those we have been able to help is Monir, a young man of 19. He earns his living by collecting old paper, tins, iron, etc. in the streets. He is very poor and like many poor people, when he takes the train to get from one town to another he travels on the roof. If you travel on the roof you don’t have to pay for a ticket. One night, when he was travelling on the top of a train, three heroin addicts started asking everyone to give them 30 Bengladeshi takas (about a quarter of a US dollar). Monir gave them only 20 takas. They were angry at this and threw him off the roof of the train. He managed not to fall on his head; but he broke his leg very badly, so he crept into a rice field and waited there till for daybreak. In the morning a man heard him weeping. He brought the young man to the railway station where a lady who lives there took pity on him and managed to get him admitted to the government hospital. Then she came and told us the news since we know almost all the children and families living in the slum near the railway station. The Mymensingh hospital is huge, with about 1000 beds, but many people also sleep on the floor. Monir’s leg was broken in two places and he had many other wounds. When the wounds healed, the doctors operated his leg. It took a very long time for him to be able to walk again properly. During the following nine months we helped Monir pay his treatment in a home for poor handicapped people. Later he found a job in a restaurant, not too far from his native village. He comes from time to time to visit our house in Mymensingh and each time it is a great joy to talk with him again! I came back yesterday after being away for ten days. I made visits in five parishes, first of all in Dinajpur, the parish of Suihari, where there was a three day ecumenical meeting. It brought together a hundred young adults from different churches. Then I went to the four parishes where I lead meetings with young people who receive a tiny bursary that helps pay for their studies. I love these journeys and visits in the North. I have already been there several times and I am starting to know the places and the people. Each time, I am received with joy and often I am invited to drink tea in the houses built of clay and bamboo. And what a joy to meet the children again! They are housed in a hostel run by the parish. It is in Chandpukur (the pond of the moon) that this year we started the group of twenty young people who are studying at the local college. They met last Saturday. The theme of this month’s meeting was Christ’s invitation, “Come and follow me”. The meeting takes place very simply: an introduction and a time of personal reflection, sharing in small groups and reporting back at the end. Each one has received a copy of Brother Alois’s Letter for this year. The young people are not accustomed to meeting in this way and to sharing their own experience. But little by little something can grow and I hope to encourage them in the development of their faith. They all come from very simple families and belong to various ethnic groups, like Santals, Uraos and Mahalis. What an adventure! More and more I speak to them in Bangla and in that way I make progress in learning the language! One of the brothers writes: This morning we were very « down to earth » in the peace group I have been helping to lead for nearly two years. We have meetings and we experiment with inter-religious prayers: very simple, with much silence, and we share about the meaning of conflict and peace in the world in general, between persons and within oneself. We also go out to schools to speak with children and young people. But how can we find something concrete to do? Right across from the building where we meet there is a garbage dump: an enormous pile of filth that gives off a pungent smell during the hottest part of the year and spills over onto the road and all over the place. So, our group decided to transform the dump into a garden! We approached the municipality, and with their permission, we chased off the cows that roamed there and fenced the place in. This morning we cleaned the whole place out. We shall plant trees in order to avoid the place returning to its former state. You may ask what this has to do with peace. Peace is a word, a concept that is great and deep. Peace does not depend on beauty. But beauty helps to create something that goes in the direction of peace. “We are preparing two ecumenical pilgrimages. Young people from different churches, from Dhaka and Dinajpur, are taking care of the preparation, visiting families, looking for disabled people among the Christian families, finding other young people who can help too… And in October and November we will be together for two days: prayer; sharing, getting to know one another. Once again it is the weak who are helping divided Christians to come together in serving other people. Several young people from the house will go each month for a time of sharing and a long prayer in towns or villages where young people, who receive support from us for their studies, are helping the poorest children: evenings and vigils of communion. Perhaps there we shall find a new way of being with the young people. I have just come back from visiting some families in the region of Dinajpur. There were marriages in the families of young people we know and who work with us in Mymensingh. It was raining and everything took place in the mud… But it was really good to see many people again, especially the Santals. Dipok, who is in Taizé at present, comes from this region. After many attempts that did not succeed, we finally had a pilgrimage of trust with disabled people in Khulna. There were 200 disabled Christians, with their families, a large group of young volunteers (many of whom took part in the meeting in Kolkata) and on the Saturday over fifty disabled Muslims and their families came as well. There was a big gathering for the inter-religious prayer at noon: beautiful Muslim songs sung by a young blind man and some very poor mothers – of families where there is no father – shared their stories. Mgr Theo was present, and the local bishop came for the end. I went with several young people to help – the journey lasted ten hours by bus! Much gratitude on all sides. The prayer with the candles on the Saturday evening was a feast! Next, we went to visit young people caring for the disabled in a large parish at Mekerpur, five hours by bus from Khulna. A good sharing. Among the young people there is much good will: if only they had people capable of encouraging and leading them. We continued our way as far as Rajshahi where a small group of young people who have lived with us here in Mymensingh are studying. They assist a group of disabled people in a house run by sisters. 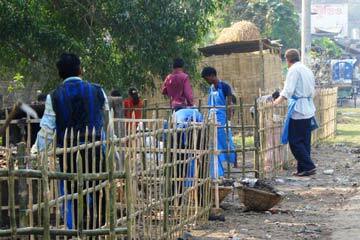 We started an “outreach program” like the “Anondo Club” in Mymensingh. Once a week at the sisters’ centre there will be an inter-religious prayer led by young people from our place. Our ten day visit in the district of Barisal, in the South East of the country, where the cyclone struck last year, went off very well. It gave us a chance to greet many people who have known the brothers since we first arrived in Bangladesh. I could see that in general, after the cyclone, the people had been materially well looked after by all kinds of aid organizations. It seems that in general everything was pretty well organized. However at the present time the economic situation in Bangladesh is really very bad. These last few months daily life has become more and more difficult. Sometimes the situation is quite preoccupying. Perhaps you have heard recently the expression “hunger riots”, referring to spontaneous revolts of the populations in various countries of the world because of the lack of basic food items, particularly rice. This is precisely what could happen soon in Bangladesh if the present tendency to rice shortages were to continue, accompanied by the very rapid rise in the prices of basic food products (sugar, powdered milk, oil, etc…). Faced with the risk in the near future of no longer having sufficient rice to feed their own populations, some neighbouring countries who in the past were large exporters of rice, like India or Vietnam, have now forbidden or strictly limited the sale of rice outside their own frontiers. Bangladesh, after last year’s huge floods, then the cyclone, at this moment has an absolute need to import rice. Sometimes during these recent weeks, as we visit very poor families we know, we can see that some who in the past nevertheless managed to have two meals a day (very simple meals, mainly of rice), now have to be content with one single meal, for everything has become too expensive. It has happened too over the last few days that in some families there has been no meal at all. You can see a new anxiety among some of the parents for their children. Since last week, and for the next two months (until the newly harvested rice reaches the markets), we have started giving rice to around thirty families who, without this, would not be able to have a single meal a day. Let us hope that in two months time the situation has improved.